NorthPoint Trading Partners LLC, a premier institutional brokerage and fund services company, today announced its selection of Trade-Ideas Pro as its advanced analytics provider. As a result NorthPoint Trading Partners’ services now include Trade-Ideas, the premier tool for idea generation technology and real-time analytics of the markets, as part of its suite of tools delivered to their hedge fund, institutional and active trader clients. “The advanced analytics, real-time idea generation, and backtesting tools at Trade-Ideas level the playing field for our clients vs. larger, more capitalized participants and provide access to opportunities previously unseen. We understand how Trade-Ideas Pro improves trading decisions. Using it convinced us that our clients need it as well – that’s why we’re giving it to them as part of our service offering,” said Douglas Nelson, Chief Executive Officer of NorthPoint Trading Parnters LLC. Some of the technical indicators produced by Trade-Ideas include unusual Relative Volume and Volatility; Moving Average Crossovers and Breakouts; False Gap Retracements; Strong Momentum, and many others. For a full list visit: http://www.trade-ideas.com/Help.html. “We are excited about our partnership with NorthPoint Trading Partners, LLC. NorthPoint offers a premier trading and Prime Brokerage platform geared toward small and mid-sized hedge funds. The majority of their clients are focused on long/short equities and equity options. One of the ways they distinguish themselves from other service providers is to offer high-touch, low cost services and analytic tools. Trade-Ideas is a great compliment to the Redi-PLUS platform provided by Goldman Sachs Execution and Clearing (GSEC) due, in part, to its ability to link directly to existing charts and order entry windows in Redi-PLUS,” said David Aferiat, Managing Partner of Trade Ideas LLC. Trade-Ideas provides access to detailed information on more then 10,000 stocks, ETFs, indices, and future contracts on all the North American exchanges. For a free demonstration of Trade-Ideas, please contact a NorthPoint Trading Partners representative. NorthPoint Trading Partners, LLC is a premier institutional brokerage and fund services company, founded by experienced industry professionals who saw a need for an independent, personalized execution and brokerage solution for hedge funds, institutions, and active traders. Through a fully disclosed clearing relationship with Goldman Sachs Execution and Clearing, L.P. (GSEC), clients receive the benefits of boutique firm service and pricing, combined with GSEC's professional clearing and prime brokerage services, integrated portfolio and trading functionality, suite of pre- and post-trade analytics, and direct access to the Goldman Sachs & Co.'s securities lending group. NorthPoint Trading Partners, LLC offers a complete package of direct access trading platforms, including REDIPlus®, GSEC's multi-product electronic trading platform that allows clients to trade across different markets and asset classes - from equities to options, to foreign exchange. In addition to electronic trading platforms, customers have access to a staff of experienced traders that have worked together for years and are very accessible and professional. For more information visit: http://www.nptradingpartners.com/index.html. As a pure pattern recognition tool, Trade-Ideas’ focus is on providing next level analytics and decision support via its browser-based or downloadable platform. 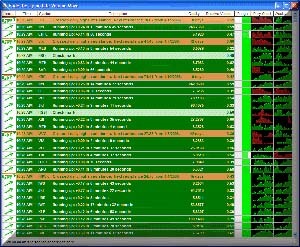 Via Trade-Ideas clients customize an inventory of alerts and filters to produce a unique view of the markets: theirs. Recent reviews from Barron’s, HedgeWorld, Equities Magazine, Stock & Commodities magazine, stock newsletters, and leading brokers describe the service as an accurate, discriminating alert provider that is flexible, simple to deploy, and easy to use. A free limited demo is offered for evaluation purposes. Subscriptions are cancelable at any time, and require no payment information to get started. For additional product information visit: http://www.trade-ideas.com. Copyright © 2006 Trade Ideas, LLC. All Rights Reserved.